Growing up in Oklahoma during the '80s, there was no NBA franchise. Fortunately, we had cable. To double the fortune, our cable package came with WGN, which may as well have stood for What Great News, because that allowed me to be introduced to the Chicago Bulls. Without a home state team to call my own, the Bulls at least seemed close enough in my mind. And with some kid from North Carolina -- who I distinctly remember a newscaster mentioning could be the next Doctor J -- I thought, "Why not? We (my dad and I) will tune in." Of course, to triple the fortune the Bulls later picked up this other skinny kid in Scottie Pippen, a much lesser known quantity, but from Arkansas, which was close enough to us. After all, I did have a friend who had moved to Oklahoma from there. The team was coming together. Flash forward more than two decades, six NBA championships, multiple all league teams, and a gold medal later, and I find myself in a radically reminiscent state. Salivating with Michael's every move also meant being informed of his teammates. And the more I watched the Bulls, the more I was moved by Pippen. It was his development that intrigued me. A once fledgling, scrawny, timid athlete that matured into a bonafide, nourished, and all-around star. He battle migraines and Pistons and personal demons. He grew a 'fro and searched for his roots in cornrows and even went Mr. Clean. He dunked on Ewing. Ferociously. And he successfully jabbed at Karl Malone with a memorable line about mailmen not delivering on Sundays. He could do a lot. Glide. Dunk. Drive. And then, all of a sudden he could shoot. He could defend. And then he could do it all. He was everywhere doing everything. Pippen's induction into the Hall of Fame this weekend forced a visit back to his accomplishments and how he captivated my mind. Below, a Scottie sojourn of sorts and ten reasons he was the man, even alongside Spike Lee's "main man." One of the first stories I recall hearing about Pippen was that he wasn't recruited to be a college basketball player. More, he became the team manager, just a six-foot-two child that would support and look up to the true players as he did his 11 siblings. And what's more, he was so weak that when first asked to take up lifting weights, he couldn't bench press the 45-pound barbell. Here's to becoming strong. Given the chance, he became a regular member of the team at Central Arkansas and averaged 4.3 points per game. He kept getting better, improved his game each year, and by his senior year was a top scorer with 20-plus a contest. A four-year player who learned the power of performance enhancement. Scottie learned to be tough, physically and even more importantly, mentally. His psychological progress as a player plodded along before our eyes. He developed from a wire of an athlete -- one who was able to accept a certain complementary role -- to one who was the best player in the league in 1994 (only to be snubbed out of official MVP honors though he was the All-Star Game MVP). 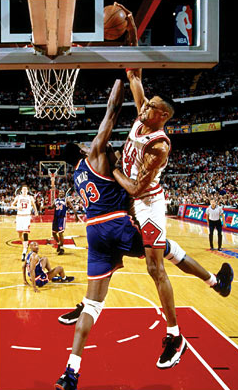 Even after Jordan's first comeback, one which Pip publicly applauded, Scottie continued to prosper and elevate his game. In fact, his Win Shares per 48 minutes in 1996 (.209) and 1997 (.203) were career highs. For those who forget or weren't old enough to observe, Scottie became the leader in 1994. He led his Bulls to a media-surprising 55 wins (Pip played in 72 games that season and the Bulls won in 51 of his appearances). He took them deep into the playoffs. The Eastern Conference Semifinals to be exact. Game 7. Yes, the one people say would have seen the Bulls win if not for a glaring controversial call. Regardless, that season was his personal best with a personal best PER (23.2). And remember he didn't get another chance to direct the Jordan-less team through the post-season again. Players with versatility stand out to me. And Pip provided the Bulls with so much talent he may as well been called Multi Purpose. During the 1994 playoffs, his usage percentage was a lead-leading 31.9 while his regular season effective field goal percentage was above 50 percent, a sound accompaniment to his career best 4.0 steal percentage. And what doesn't appear on paper is how he directed the triangle offense and made his presence felt on defense. To speak even more about his defensive prowess -- a skill the league certainly kept track of to the tune of 10 All-NBA Defensive honors -- just picture a guy that can guard any position on the floor. The popular image is the one of him guarding Magic in the '91 Finals and completely disrupting the Lake Show. But what about post D? Wing stoppage? Just watch the video to appreciate. On-ball steals and passing lane thefts. Blocked shots. Chase down swats (before LeBron was even a teenager). And a defensive coach's dream: taking charges. He understood how to get it down in every was possible manner and relished the role. His steal stats and defensive ratings only provide a brief of glimpse of his mighty brilliance as a defender. What else could he do? Everything. And even more, some say, than Mike the Greatest. In David Halberstam's Playing for Keeps, the truth be told ... There was, though, one move Pippen could make that Jordan could not: If they both stood out of bounds under the basket holding the ball and leaped out on the court, Pippen, without ever touching the ground, could slam the ball through with his left hand, and Jordan could not ... I recall Jordan even talking emphatically about how Pippen could jam on people in traffic with his left hand while Michael had trouble executing the move. Even more impressive is a fundamental drill I learned about long ago that highlights Scottie's explosiveness, balance, and length. He was able to pick up a basketball from the court, free throw line distance away from the rim, and dunk it without a dribble. Immediately after, he could scoop up another ball from the foul line and replicate the motion. It seems nuts, but he could do it 15 times in 30 seconds. That's 15 slams in half a minute. The bank shot. Enough said. Despite all of his basketball accomplishments, his mind-blowing artistry, his overcoming adversity at a young age -- and even dealing with and coming to grips with his own poor decisions that may have lasted but a couple of seconds -- Pippen-haters don't want to believe in him. They say he was not a winner without the other guy. Well, the other guy was not a winner without him either. Scottie always had to prove himself, and that mission motivated him to become not only great but one of the best players of all time. The Knickerbockers were slammed by him enough to understand. How nice for Bulls fans to know Pippen was actually obtained via an original 1987 first round Knick pick until New York traded the slot to Seattle for eventually, uh ... Mark Jackson?! ... and years later, after Pip's tenure with the Bulls was up, he was dealt for not one, not two, not three. Oh gosh. Not four. Not five. But six players to Portland. Perhaps that is the true mark of greatness. Judging worth with a simple correlation: every player we trade for you represents one championship ring. It's Psi, the 23rd letter in the Greek alphabet and a common symbol for psychology. Further, it's the first letter of the Greek word "psyche" which means spirit or soul. Fittingly, it's also the grooves on a basketball. Interested in playing for Caltech? If you are a high school basketball player with a love for math, science, and engineering, let Doc know. Fill out the Caltech Basketball recruiting questionnaire. Enhance physical and mental skills with Doc Eslinger and the Caltech staff! Have you been to the top? "In order await the disordered; in tranquility await the clamorous. This is the way to control the mind."